Bugs and Fishes by Lupin: Lots of Places to Buy Giant Buttons! (Unless otherwise noted, the shops in this list are based in the UK). Overspill sells 8.5cm (3.5 inch) wooden buttons. Love Craft sell 8cm wooden buttons. 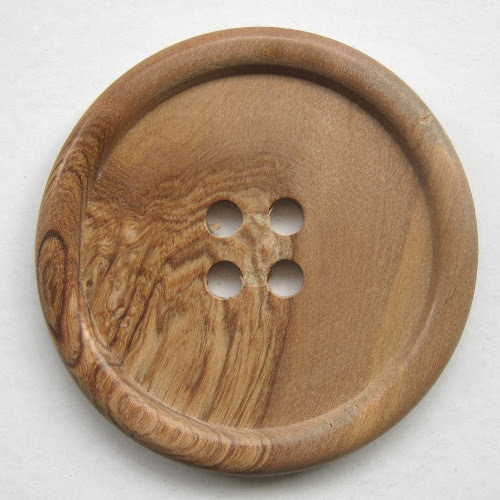 Wool & Buttons sell 7cm wooden buttons that are handmade in Yorkshire (choose from oak, sycamore, laburnum and cherry!). Big Fish (one of my current sponsors) sell 8.5 cm (3 inch) plastic buttons in lots of different colours. Textile Garden sell 8cm (3 inch) and 12.5cm (5 inch) wooden buttons. You can also buy 8cm or 12cm wooden buttons from my former wholesaler, Bits and Bats (I'd recommend ringing to check if the buttons you want are in stock as they weren't always available). Keal Concepts on Etsy custom make handmade wooden buttons up to 11 inches. Cold Creek Brewing sell handmade giant wooden buttons (and giant wooden needles!) up to a massive 17 inches. They're based in the US but international shipping is available. How about some button-shaped homewares? Wood Power (based in Latvia) sells handmade button shaped wooden coasters (11cm). Sew Kidding sells colourful silicone button coasters (8.7 cm). (These are also available from Berylune). Shigeki Yamamoto sell fun handmade wall hooks shaped like buttons (15cm) (they're based in Germany but ship internationally). Snug Studio sells handmade wooden boards / trivets shaped like buttons I have one of these, it's great (and a massive 24 cm). Snug Studio are based in Germany but ship worldwide. I've also spotted their button boards for sale at UK-based Berylune. And IKEA sell a set of 3 giant buttons for decorating your walls (25 and 28 cm). They also sell a colourful button-themed rug! ... or make cardboard giant buttons for a sewing party. If you've spotted any other huge buttons for sale, do leave a link in the comments! Update: Daisymoon Designs sell MDF buttons in 3 sizes, up to approx 29 cm. Awww, I really want the wooden hanger for my sewing room - wouldn't that be cute? Katie - it would be adorable! Anon - you can use the big buttons for adding to cowls, bags, coats and cardigans... and use them for crafting, too.